In the wake of severe floods in Myanmar, our hearts and prayers are with the families who lost loved ones and are displaced from impacted areas. Episcopal Relief & Development is in communication with partners. We acknowledge their pain and want to take this time to highlight the importance of preparedness and resilience. With assistance from Episcopal Relief & Development and local partners, small-crop farmers in Myanmar are finding ways of keeping to their tradition of growing rice, while increasing their overall production and economic stability. Our partners in Myanmar recognized that this seasonal pause in production could be an opportunity for farmers like Mg Kyut Yin. Through an integrated development approach, unused church land was mobilized for community use, and asset-based trainings guided families in assessing the nutritional and other benefits of popular seasonal crops. Okra, varieties of gourds and eggplant, and groundnuts (peanuts) emerged (after much discussion!) as favorite options. Especially groundnuts, as along with being a food source, they require less water than other crops, absorb nitrogen from the air and enrich the soil for the next planting season. To strengthen community resilience, our partners also offered disaster preparedness training to equip communities to better manage their own response and recovery including asset-mapping, hazard analysis (floods, landslides) and household preparedness kits. Economic opportunities, such as micro-loans or savings programs, are being considered for the future so that households are able to absorb the economic impact of disaster shocks, like the floods in southern Myanmar, and recover faster. 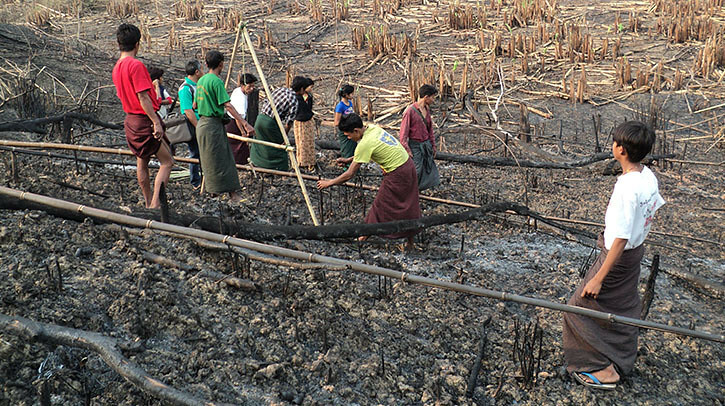 Episcopal Relief & Development partners with communities throughout Myanmar. Below is a series of photos that showcases a farmer training program in Mandalay. Images: (Top) Mg Kyut Yin and his wife, Naw Paw Lay Hto; (Middle) Farmers in Mandalay, Myanmar learn new agricultural techniques.